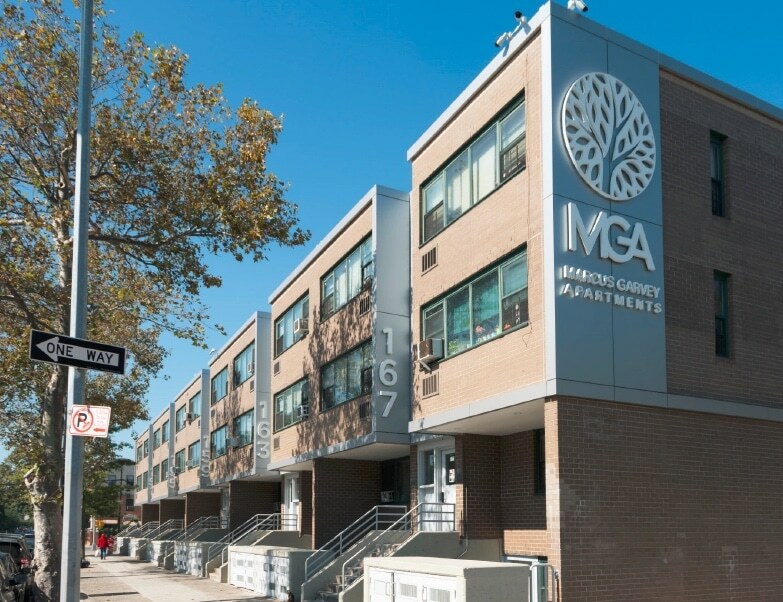 Demand Energy, a wholly owned subsidiary of Enel Green Power North America, Inc., today announced that construction work has begun on the company's groundbreaking renewable-energy-plus-storage microgrid at Marcus Garvey Village, a mixed-income apartment complex in New York City owned by L+M Development Partners. "We're proud to be designing and building the city's first lithium-ion battery-based microgrid," said Gregg Patterson, President and CEO of Demand Energy. "We've worked closely with the Fire Department and Department of Buildings in New York City to earn their approvals and achieve this milestone in storage deployment. Lithium-ion is a proven technology that offers multiple advantages over other chemistries, especially in urban installations. We look forward to bringing the benefits of this first-of-its-kind microgrid to the Village's owners and residents." The Marcus Garvey microgrid consists of a 400 kW solar PV system and 400 kW fuel cell, supported by 300 kW / 1.2 MWh lithium-ion batteries and controlled by Demand Energy's Distributed Energy Network Operating System (DEN.OS™), which optimizes how these resources interact and perform. The system will reduce the property's power consumption by managing the generation and storage of renewable energy to save money through demand charge reduction. It will also provide resiliency during an outage, lower operational cost, deliver essential load relief for Con Edison, and help reduce greenhouse gas emissions. A key technical aspect of the project is the ability of DEN.OS to ensure that the housing development self-consumes any energy it generates, without exporting to the grid. That capability directly aligns with Con Edison's Brooklyn-Queens Demand Management (BQDM) requirements, which facilitated the interconnection and permitting process. New York City has long been a strong proponent of affordable housing like the 625-unit Marcus Garvey Village. More recently, the city has advocated for increased use of renewable energy and improved energy consumption and efficiency. This landmark project combines both initiatives, with the added benefits of energy security and resiliency in the event of a power outage, as well as revenue streams from providing useful grid services. In September 2016, New York established an energy storage goal of 100 MWh by 2020, along with an expanded solar target of 1,000 megawatts by 2030. Storage is expected to play a key role in meeting the city's plans to cut greenhouse gases by 80 percent by 2050.